Our pigs are fed organic feed and organic brewery grain. A heritage breed, our Tamworth pigs are hand raised and free-run. We don't use any medications or hormones in our cultivation and our processed meats do not have added nitrites. Tamworth pork is naturally lean without marbling. This tendency, coupled with the high protein brewery grain feed leads to a very flavourful, lean meat. The fat is on the outside and is easily trimmed. Our Tamworth pigs also play another role on the farm. We use their natural behaviour of "rooting" (digging through the earth with their very strong snouts) to help prepare our fields for planting. 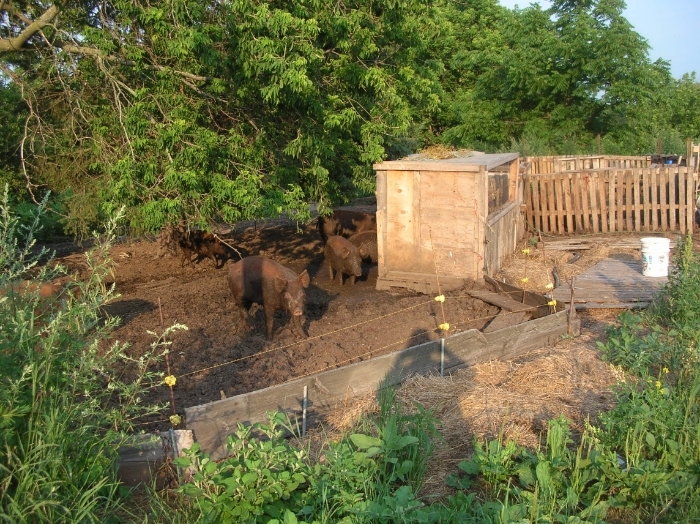 The pigs eat the roots, grubs and weeds, leaving the field clear for our vegetable crops. And they are very efficient! In fact, other farmers who see one of our fields after the pigs are done with it assume the work was done by a tractor. Pork is available in individual cuts, or as whole or half pigs: cut and wrapped to order. Contact us for pricing. We have: bacon, peameal bacon, sausages: bratwurst, debreziner, hamburgers, pork chops (thin or thick cut), tenderloin, ground pork, leg roasts, loin roasts, hocks, pork bellies, and other cuts. Pick-up at the farm for a meat order by is possible by appointment. Delivery within 100km of the farm is available for an extra fee. (Minimum order applies).